Ashley Slote, owner of The Office Genie LLC. For many business owners, bookkeeping is an unpleasant experience — and that's where Ashley Slote comes in. "People bring me in for that reason — they don't like doing it," she said. "That's the last thing they want to do." Slote is the founder of The Office Genie LLC, a mobile bookkeeping service for business owners and individuals in Fairfield County. Slote, who will be celebrating her first anniversary in business next month, views bookkeeping through a somewhat heroic spectrum. "The thing I really enjoy is that I come in and solve problems," she said. "And when you need a bookkeeper, that often means you have a problem that has to be solved. Your ducks need to be in a row and you need to have everything ready to go for taxes." 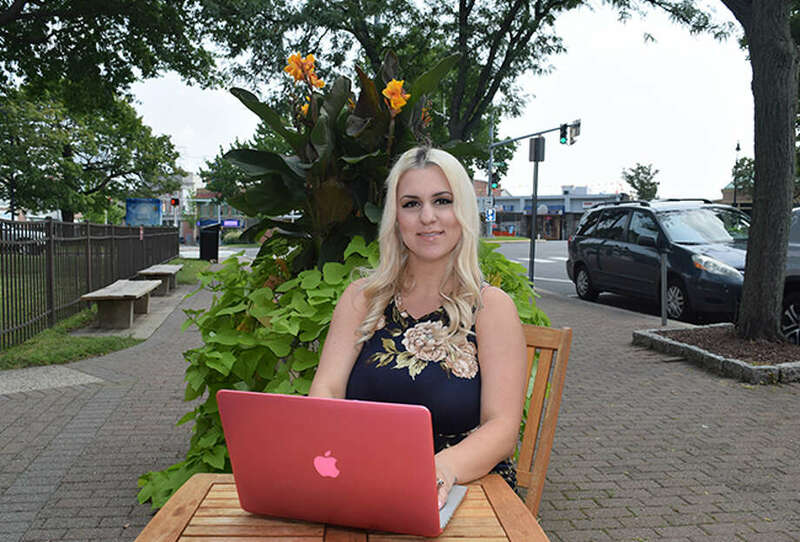 Slote, who holds a Bachelor of Science degree in business management and an MBA from Southern Connecticut State University, did bookkeeping for a landscaping company and a few freelance gigs before deciding to become her own boss. "I had a few people approach me who wanted to be a client," she said. "I had a guy referring a lot of people to me. And it was funny that he did that because I was thinking of starting on my own." The Office Genie covers tasks ranging from helping startups with their business formation and payroll processing to assisting established businesses with their financial reports for quarterly and annual tax filings plus accounts payable and receivable. For individual clients, Slote provides input on personal bookkeeping needs and bill paying. Slote works from a home office in Norwalk and spends much of her time traveling to clients across the region. "I go to Easton, I go to Ridgefield and Redding and Trumbull," she said. "My other clients' businesses are run out of Fairfield. It's funny, but I don't have any clients in Norwalk." In running The Office Genie, Slote puts in lengthy days, sometimes working from 6 a.m. to midnight. And while she enjoys meeting with clients, she admitted that her concentration is best when working out of her home office "because that's when I get the time to dial in and get the real work done on the numbers." While referrals and word of mouth have helped bring in business, Slote has also tapped into Craigslist advertising to call attention to her service. She already snagged two clients from the popular site, although she admitted she also harvested some sketchy responses. "There has been some spam text and emails, but I can tell by this point what's what," she said. "I do a lot of Googling of names, emails and phone numbers before I will talk to them." One concern that has kept Slote busy on behalf of her clients is the federal Tax Cut and Jobs Act that was signed into law last December by President Trump. Slote said the changes to the tax code have yet to create a negative impact on her clients, but she added there is still uncertainty on what the near-future will bring — especially with the new law's limits on individual state and local tax deductions to $10,000, which are considered by many to be difficult in high-tax states such as Connecticut. "Time will tell," she said. "Next year, we'll see how the real numbers work for everybody." As for her next year in business, she is planning to bring in an intern to help with her growing duties. "Last week, I was doing a lot of data entry work for an account I was working on and I thought it would be great if I had a person to do the data entry for me," she said. And while she admitted that there are software programs that can assist business owners with bookkeeping tasks, having a professional can offer a personalized attention to detail that software cannot duplicate. "I think it is really important that everyone with a small business has a bookkeeper," she said. "It doesn't have to be regularly scheduled. I can spend an hour or so a month with you, that will keep you going. Also, it is better to hire a bookkeeper before things get tumultuous and challenging. It doesn't have to be a full-time person, but you can call in a person like me to check things out." Phi Hall is a reporter for the Fairfield County Business Journal. For more of his work and that of the journal, please visit westfaironline.com.